For media inquiries, contact Cynthia Meyer at CMeyer@COchamber.com. 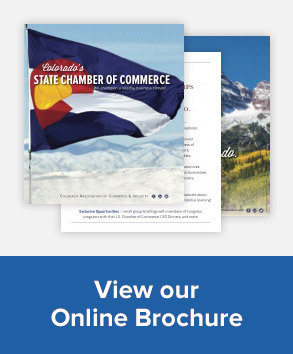 DENVER – The Colorado Chamber of Commerce joined with the U.S. Chamber of Commerce, local chambers and business organizations to testify late into yesterday evening against Senate Bill 188, the Family and Medical Leave Insurance (FAMLI) bill. Public entities also joined with the business community to oppose the bill as amended, including the Colorado Municipal League, Colorado Counties, Inc., the Colorado Special District Association, and county commissioners from across the state. Furman also clarified a misperception surrounding paid family and medical leave that she said need to be corrected. “The proponents have claimed that 88 percent of workers do not have access to paid family and medical leave. That’s actually not accurate – many employers already do provide paid leave to their workers, and if this bill were to pass, it would force them to pay into a state program and make the decision whether or not to keep offering their current benefits,” Furman said. She cited a survey that found approximately 88 percent of the Colorado businesses polled provide paid family and medical leave in the form of sick leave, personal leave, vacation, or another type of leave. She also addressed a recent amendment that was added to the bill in the Senate Business, Labor and Technology Committee last week, which provides a “discount” to some entities and not others. The fiscal implications of that amendment are not clear and will have to be backfilled, she said, and there will have to be a dramatic increase in cost for everybody else to pay for it. Stacey Campbell, Board Chair-elect of the Colorado Chamber of Commerce, has also been heavily involved in negotiating with the bill sponsors on this legislation. At the hearing, he highlighted concerns about maintaining the current leave programs employers already have in place. Sean Redmond, Executive Director of Labor Policy for the U.S. Chamber of Commerce, also testified Tuesday evening. Redmond also described some of the key differences between SB 188 and the paid leave laws passed in several other states. “States such as New Jersey and Massachusetts have included provisions to exempt employers who already provide more generous leave programs. This exemption is important for workers, because the worst outcome would be to pass a bill that causes employers to reduce the amount of leave they provide to match a new state standard,” Redmond said. Ben Hase, on behalf of the Employers Council and who has been in the trenches working on this bill, urged the committee to not adopt a bill that lacks even the most fundamental protections for employers that exist not only in the federal Family and Medical Leave Act, but many state family and medical leave laws. To view a full list of stakeholders opposed to SB 188, please click here.